Dr Anne de Bono, chair of the NHS Health at Work network, has described reports that one-third of GPs do not have access to OH support as “extremely worrying”. The revelation was made in GP trade newspaper “Pulse”, which carried out a survey of 441 family doctors in August. It also found that one respondent in eight had sought help from pastoral or wellbeing services within the past year, with one GP even admitting to having spent £2,000 on private psychotherapy in an effort to better handle his workload pressures. The paper is running a campaign, called Battling Burnout, designed to highlight the pressures GPs are working under. A Freedom of Information request by the magazine found that 32% of primary care trusts that were able to provide information had no contracts in place to provide OH to GPs or their staff. De Bono stressed that OH should be available for all NHS staff, arguing “those working in primary care should receive the same overall provision as their colleagues in secondary care”. “Occupational health specialists can help with ‘burn out’ or stress, but our remit is much wider. We bring a unique understanding of all of the specific health issues affecting healthcare workers. For example, we provide advice in relation to blood-borne viruses; support GPs in their role as employers [hazard identification, risk management and staff management particularly in relation to fitness for work]; and provide specialist services for ‘doctors in difficulty’,” she added. 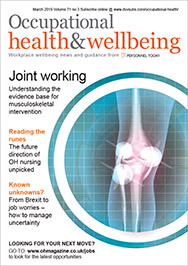 In a separate development, the NHS Health at Work network has outlined a range of issues for OH to consider in response to the NHS’s Working Longer Review, which was set up to consider the possible impact on the NHS of a raised pension age and ageing workforce. The review specifically wanted to get a clearer sense of: what happens in organisations that makes it easier for people to stay in work longer; what makes working longer more difficult and why; special issues for particular groups of staff; and what people felt could be changed to support people working longer. Points highlighted included the sheer physical demands of many NHS roles, and how an employer of an ageing workforce may need to manage this. There will need to be a greater focus on more flexible approaches, shift length, health issues around night-shift working and workers continuing to work while managing chronic conditions, it suggested. While ageing could affect almost any role, jobs that involved lifting (such as nursing), being on your feet all day (catering) or working at height (builders) could all become more problematic. There will need to be a greater consideration of alterations of roles or remits for over-65s, more prioritising of provision of appropriate and sufficient handling equipment and more flexibility around roles, it also suggested. Other comments included the possibility of shifting OH more into the health assessment arena and for there to be more clinical long-term follow-up systems for staff with chronic health issues.